Inside corners are no fun to mow. I used to have one that was bounded by the driveway to the east and a fence surrounding a utility area to the south. With a car usually parked along the edge of the driveway, mowing involved a lot of back and forth, tight turns and paying attention to which way the wind was blowing so the car didn’t get covered with cut grass. In these situations, I like to use a landscape bed to round out the inside corner. However, this area was also a well trafficked area just outside the garage walk door. I didn’t need to install a landscape bed and have a path beaten through my plantings. Once we were comfortable with the layout, we rented a sod cutter for removing the grass. Then we installed edgestone pavers along the border of the bed. (These are great for making curves.) 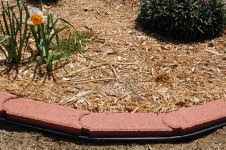 I like to install a flat solid edging between the lawn and the edgestones. I find that this makes it easier to maintain a clean edge and keep the grass out of your bed. 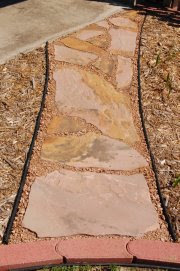 I used black plastic edging with a large bead at the top for the sides of the path. The path was constructed with flagstone that was “grouted” with decomposed granite. After this we installed the plants and mulch. This area is now much easier to maintain. Added benefits include the reduction of thirsty lawn grass and more camouflage to pretty up my utility area. You never know where your next spark will come from. My most recent one came from an alchemy listing on Etsy. Could I make a “feather wrap” pendant? My first thought was, “What is a feather wrap?” After doing some research and conversing with my prospective customer, I was excited. I love working with nature’s materials and the challenge of custom work. I use a lot of shell, wood, gemstone and freshwater pearls in my jewelry. So, it was an exciting prospect to learn how to work with feathers, leather and horse hair to complete this request. I enjoyed working with these new materials so much that I decided to add a couple of designs inspired by the spark of the alchemy listing to our shop. You will find them listed in the Feathers n Wood section. What spark will come my way next? Will it be related to jewelry, gardening, photography, graphic design or something else? I don’t know, but I do know that it will present a challenge, and I love a good challenge. It’s almost May 12th ! ! All you mothers out there know what that means. Maybe your day will be a little different, when you’re recognized as the family’s “unsung hero”, or at least a day with less “grunt work” and a few moments of fun set aside with loved ones. Your answer is Etsy, the site for so many reasonably priced - - but even more important - - unique gift ideas! Is your mom a collector of specific items (animal figurines, pretty note cards, cups and saucers, vintage stuff of all kinds)? 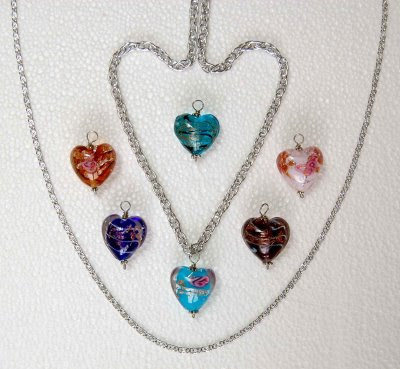 Or maybe your mom delights in one of a kind jewelry that is chosen with her special color palette and style in mind. All these things and more can be found at Etsy.com. 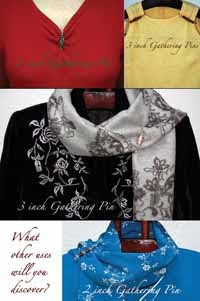 Especially thoughtful gifts you can’t find at the local mall - - and from the comfort of your own home! Mother’s Day thoughtfulness doesn’t have to be reserved just for your mom, but can include your wife, daughter, friend, or mentor. A perfect time to say “You’re special to me” with a thoughtful gift or card to that special woman who has made a difference in your life. Visit our shop at www.edccollective.etsy.com. Enjoy shopping and the Etsy experience. Everyone loves finding and owning the latest thing. We have discovered and are offering a new fashion accessory. Our new product line takes the old concept of a pin and puts a new spin on it. These lovely pins clasp your fabric instead of poking holes like a standard pin. 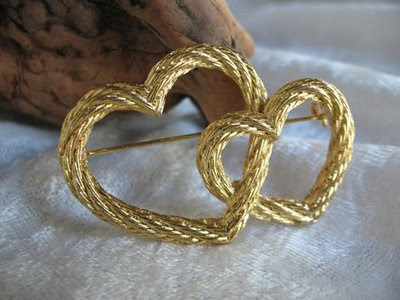 They work by gathering up the fabric and stay in place by holding it in the tension of the clasp. They can be used so many different ways. See some of them in the photos above and read the suggestions below. I’m sure after you try them you will find even more uses for these delightful decorative accessories. 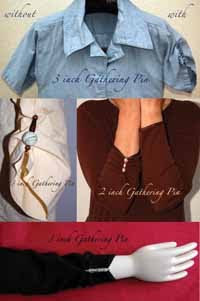 Use them as sleeve pins, an attractive alternative to rolling or pushing up your sleeves, long or short. Use them as bodice pins to make your outfit more alluring. Use them as scarf pins. The small, 2 inch, gathering pins work well with lighter weight fabrics and short sleeves. The regular, 3 inch, gathering pins also work on heavier materials, including sweaters, and instances where a lot of material is to be gathered, such as layered blouses and tees. Open the pin and slide the head of the pin under the material to be gathered, leaving the beaded side on top. After you have gathered (or shirred) your outfit to the desired look, close the clasp around the fabric to hold it in place without piercing your fabric.